If you need advise in o2 modeling or texturing ask your question here. Hi evrybody, now Jukka has done the textures for the sherman, but he can't apply them to the modle it's self.Could anyone who knows how to apply textures to a modle please post here with the how to do it.Think about it people, the sooner this is done, the sooner you get an M4A1 sherman tank! It's actually the model maker's job. Well, kinda... He needs to do a mapping of the model, then he'll send it to the texturer who then starts creating the texture with the help of the mapping. Ps: I think you should release everything at the same time, not single addons. It's just messy that way. Thanks for the help Rellikki. Свинья спайдера, свинья спайдера, делает свинья спайдера делает, может он отбрасывает от стержня, никакого он не может он будет свиньей, взглядом вне, котор он будет свиньей спайдера. texture you can do using blueprints / view from one side, view frm top, hatches, wheels, details, engne cover , rear side and etc. Thanks for your help folks! @Vilas, no no no no no, you can do like that. you can't use tons of textures in arma. you need to make an uvmapping of the tank. if you don't make an uvmapping the textures will be streched, or some parts won't fit perfectly the model. and on a blueprint, you can't see the hidden faces. In WW2 we want fight! OK, what's your skills soldier ?! That's not enough, soldier!!!! You should know it!!! Well IIRC you HAVE to remap the model in o2. There is no way around. I already suggested Joe to work through the brsseb o2 tutorials. Faust you are the best! Glad to have you in our team.Them textures are loverly! Absolutely misplaced comment GIJOE94. Faust posted here because he was asking for help in modeling/texturing. If you want to criticize his work for the ArmA 1943 Mod, do it in the dedicated ArmA 1943 thread in the Mod section. You simply can't hijack any thread for your purpose dude . you can use 3ds amx to import models and textures into O2, as i have done it before (Just not yet for ArmA). - You then import the model into O2 (there is an import button somewhere), it will enter O2 as an untextured model. - you then have to do some funny trick i can never remember, where you select all the faces on the model, and change it so they look for the texture files. This involves changing the name of the texture, the file location etc. - That should have the textures correctly applied, the model will look just like it did in 3ds max, just a little bit shittier (in Flashpoint atleast) but its all good fun! Dont forget to make LOD's, none of the flashpoints generate them on the fly, and also dont forget that ArmA uses Normal and Specular mapping! So he tells that it is possible to import model with texture. So where is true?? i use also 3dsmax. yes in o2, the uvmapping will be the same that in 3dsmax. you just need to export (in 3dsmax) your model in the .3ds file and when you are in oxygen, you just need to import your 3ds file. it's all. but if you want a better look for your textures, open the TGA in paatool and save them again in paa or pac. btw when you import your model in oxygen, don't forget to import it (and the textures) in the good folder, with the final name. 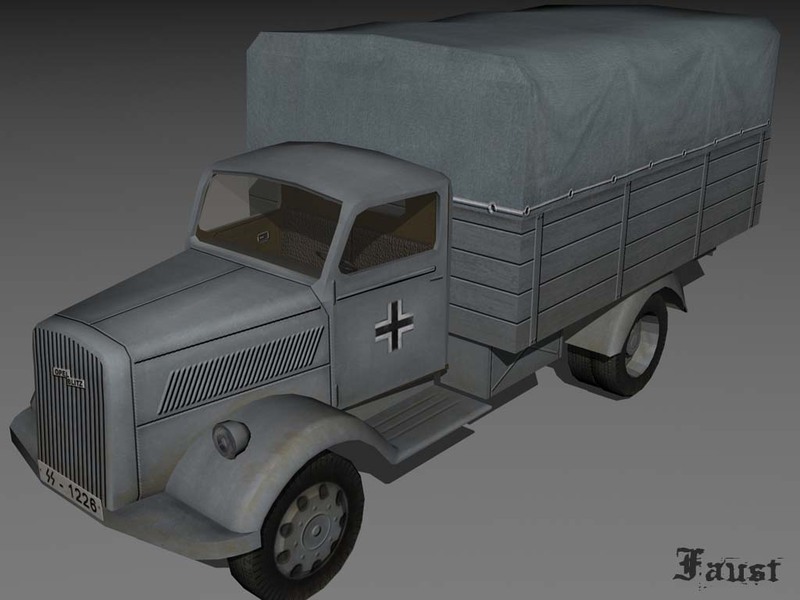 Hi folks, I need help because I have the textures for the Opel Blitz, but I don't know how to add them, can anyone help? could you explain a little bit? the blitz has an uvmapping? When looking at the screenshots with normal maps applied, you would get the idea that it does. If so, then all you need to do is make sure that the texturepath(s) in the model-file is/are pointing towards the texture(s). i open TGA in TexView2 and save as paa , is is allright too? or paa tool is better? why? what does it do? After you've applied sharp and smooth faces, you select the entire model and press F5, this recalculates the lightning on all faces, most of the times getting rid of incorrect lightning. this is only if you import a model in o2 (i suppose). because i do the the sharp/smooth edges already in an other 3d modeller but o2 don't keep that. (o2 is a crap, this is also one of the reasons why i stopped my project. oxygen is a waste of time). i hope for you that the new one will be better. vilas helped me with opel blitz and its allready driveable in Arma, but textures are not working correctly, in any angles truck is very dark and normal map is not working and in another angle truck is very brighten and normal map is OK, vilas told me that i have to create _SMDI map, its specular map, isnt it? is problem in this map? cuz i think that dirty car shouldnt have specular map which reflect light or yes? yeah you need a specular map. it's a greyscale texture. white, bright gray for the luminous faces, black for the others.